Unlike other major cruise lines, where cuisine is fairly uniform on every ship, food varies across the MSC fleet, and depends heavily on the executive chef on the particular ship. We're delighted to report that the exec chef on Opera, Giuseppe Matarazzo, runs a fine kitchen, and we were very impressed with the quality in all the eateries. Being one of the smaller ships, there are no specialty restaurants, just two main dining rooms, a buffet and a couple of fast food outlets. All the pasta, pizza, pastries and bread are made fresh onboard daily, which really raises the quality of the food on offer. We enjoyed delicious pastries in the morning, with fine Italian coffee; and excellent fresh bread at lunch and dinner, including rosemary-infused focaccia and outstanding tortellini, with walnuts, olive oil and fresh herbs. There are two main dining rooms La Caravella and L'Approdo. Both feature traditional seating (set time, set tablemates) at dinner, though the latter also features myChoice Dining for passengers who have chosen the Aurea experience. MyChoice Dining allows for dining between 7:15 p.m. and 10: 15 p.m., but it's advisable to ring ahead to advise the dining staff of the approximate time you plan to eat. MSC's dining experience harks back to a golden age of traditional cruising, so expect dancing waiters, birthday serenades and the Baked Alaska ceremony. La Caravella (Deck 5): This is the larger of the two MDRs and is designed in a light green color. Table sizes include for two and four and larger tables with banquette-type seating. There is a raised section in the center and the ceiling is low, which gives a feeling of intimacy. Breakfast: is served just in La Caravella. Breakfast is buffet style, with a range of cold cuts, fresh pastries, cereals, fresh fruit and hot food including eggs, bacon and sausages. There is tea and coffee served at your table. Lunch: Lunch is served buffet-style and makes a much more civilized option than the stampede at the buffet. There is waiter service for drinks. The buffet is set up at one end of the room, and will include an appetizer which might be a seafood salad; a choice of meat, fish or veg for the entrée as well as a choice of sides and veg; followed by dessert. Dinner: Menus at dinner offer six courses every single night, with appetizer, soup, salad, a risotto and pasta du jour, main entree and dessert. There is no "typical" night; every night is themed (Mediterranean, TexMex, Cuban), and you'll get regional specialties, which are often exceptional. On our Mediterranean night, we started with moules mariniere and a selection of Greek dips (hummus and baba ganoush), which were delicious. There were two soup choices -- a French fish soup or a spicy tomato soup -- followed by either a paella or a risotto. There were three main courses, all of which were delicious: a Tunisian couscous, with chicken and lamb; sword fish and sliced beef grill striploin which was melt-in-the-mouth cooked. Desserts included baklava and profiteroles. On other evenings, we enjoyed a rich and tasty chocolate mousse cake and crepe suzettes, which were light, caramelized and served with hazelnuts. There is always an ice cream selection. It's worth noting, too, that the pasta and risotto selections are served in portions too huge to be considered a side order. There is always a vegetarian dish to choose from the starters and mains, in this case tasty chickpea falafels, with yoghurt sauce. You can also mix and match from an Alternative Choice (always available) menu which features entrees of hoki fillet, steamed or grilled chicken breast and a meat dish every night. There are also a couple of alternative starters to choose from, usually reflective of the region the ship is sailing in. The ship does cater for food allergies, but you need to advise ahead of time (as in before the cruise) to ensure you are catered for. Service is excellent: attentive, friendly and knowledgeable, with preferred dishes and wine choices remembered. There are two gala dinners every seven-day cruise which feature even longer menus, often from a celebrity chef. MSC has a link up with Italy's equivalent of Gordon Ramsay, two-Michelin starred chef Carlo Crocco, who fronts Masterchef Italia and Hell's Kitchen Italia, who designs one of the dinners. On our sailing we had a delicious six-course menu, starting with shrimp cocktail, and followed by a lobster bisque, tortellini stuffed with asparagus tips and either a fillet of salmon or roast fillet of beef, followed by a chocolate cake. There is an extensive wine list with the emphasis on Italian wines of course, but also plenty of choice from New World and other European countries. Glasses start at 5.50 euros, bottles at around 21 euros. L'Approdo (Deck 6): The smaller of the two MDRs is designed in a soft color palette, a kind of light red with lots of mirrors and lights; with a slightly raised center and tables ranged round and along two separate corridors. The ceiling is very low, so there is no sense of grandeur as you might find in some MDRs. There are plenty of different seating options, with lots of tables for two. It features exactly the same menu as La Caravella. It also has a separate section reserved for MyTime Dining. Open: Breakfast (La Caravella only): 7:30 to 9:30 a.m.; Lunch: noon to 2 p.m.; Dinner 7:15 p.m. and 9:45 p.m.; and from 7:15 p.m. to 10:15 p.m. for myChoice Dining (L'Approdo only). 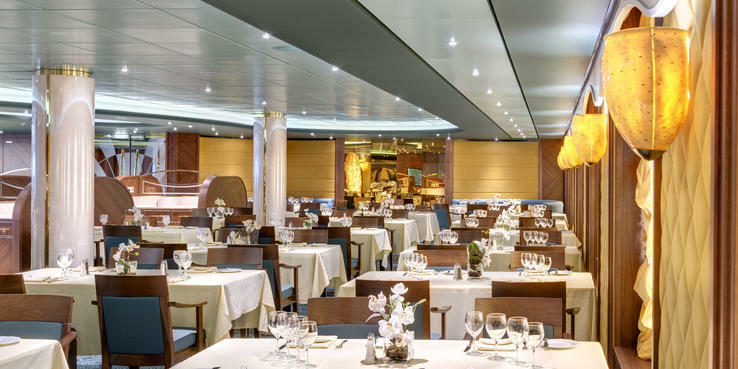 Le Vele (Deck 11): is the ship's buffet restaurant and it offers lido-style fare. Breakfast items feature the usual (scrambled eggs, bacon, hash-browns and breads). At lunch, there are two food lines (and a separate dessert and fruit station). Several salads, an array of cold cuts, hot and cold items, pastas, a carving station, a variety of fresh fruit, and some mushy, institutional desserts are available at lunchtime. Pizza and burgers are served throughout the day. Note: It gets packed quickly, with long lines forming at peak times, and it is sometimes hard to snag a table -- our advice: head outside to the Il Patio area, where there is a lot more seating. Open: 6 a.m. to 2:30 a.m.
Il Patio, located outside of Le Vele, offers al fresco snacking most of the day. On one side is the pizzeria, making fresh oven-baked pizza of at least four varieties and two pasta choices. The other side is a fast-food area, which serves in the morning as a made-to-order omelet and pancake station, and in the afternoons cooks up grilled burgers and hot dogs with fries and salads (with condiments). Open: Same times as above. Room Service: Room service options include Caesar salads (with or without chicken), pizza (for a charge) and a sandwich. Breakfast is served from 7:30 a.m. to 10 a.m. and includes tea and coffee, hot and cold milk, juice, rolls and croissants and toast, and yogurt, but no cooked food.